Visit aramcoexpats.com from August 28th through 31st for coverage of four fun-filled days of familiar faces, friendship, and memories at the Saudi Aramco 2004 Annuitants Reunion in Pinehurst, North Carolina. 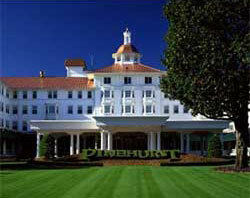 Registration is scheduled for noon on Saturday, August 28, at the world-class Pinehurst Resort, a place of timeless golf traditions complete with 8 "hallowed" golf courses, tennis courts, pool, ballroom, and full spa. Guests will settle into the award-winning Pinehurst Resort accommodations, perhaps tour the grounds or just relax, or perch in the banquet room in anticipation of friendly faces. Later that evening, guests are invited to attend a cocktail reception followed by a sit down dinner in the Grand Ballroom with guest speaker, Mr. Mazen Snobar, President, Aramco Services Company. Sunday, August 29, guests may attend early Mass followed by fellowship, then participate in either the Bridge social or take the shuttle for a day of tennis matches. During this time, there will also be sideline exhibits to visit, including an Aramco ExPats booth. That evening, weather permitting, guests will enjoy a poolside reception and dinner. Monday, August 30, is the golf tournament. Those who don't wish to golf may play Bridge or visit the many exhibits, relax by the pool or indulge at the spa. A formal reception and dancing are on the agenda for Monday night. Tuesday, August 31, after a continental breakfast, guests will say their good-byes prior to departure. Join us August 28th through 31st. Even if you can't be there, we'll make you think you are!